Our Boston NPR stations are in the middle of pledge-drive mania. I like to make the occasional contribution to them and to PBS for the great work they do. (Or maybe just to make the pledge drive stop). Here at the Historical Society we also have to pass the hat, so to speak, now and then, and ask members and non-members for renewed support. I paste here part of current society president Mark Smith's recent email on the subject. But the Society faces considerable challenges, particularly in the current economic environment. Although we function on a bare-bones budget, we depend upon the generous contributions of friends and members who share our vision. To end the year in the black, we need to raise an additional $25,000. . . . our goal is reachable. 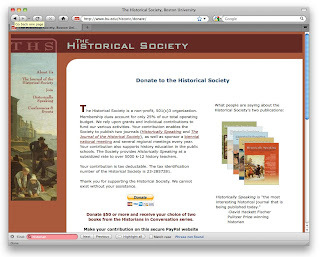 Please consider making a tax-deductible gift to the Historical Society. You can do so quickly and securely at www.bu.edu/historic/donate. If you decide to donate $50 or more, we will send you two volumes of your choosing from the University of South Carolina’s excellent Historians in Conversation book series, edited by Historically Speaking senior editor Don Yerxa and Historically Speaking editor Randall Stephens."